TU Delft's unique social position, as set out in 'Challenging the Future', means that our programmes are designed with the engineers of the future in mind. It is these young engineers that will develop novel solutions to the global challenges of the year 2040. The world's population is expected to grow to 9 billion people by 2050, but as yet the living standards of the vast majority of the world's population still lag far behind those of the rich developed world. Rising living standards in the developing world represents the greatest challenge of the future and will unleash complex issues. Increasing energy consumption and dwindling natural resources, a worsening climate problem, globalisation, structural poverty, urbanisation, war and international migration would all seem to be in store. In the context of such developments, the Faculty of EEMCS has a clear vision of its role and responsibilities. Electrical engineering, mathematics and computer science will make vital contributions to global welfare, well-being, and security. ICT will play an essential role in our future society. It will be a driver of ever greater globalisation, connecting a world which will become totally networked at all possible levels. Expanding virtualisation will also lead to new paradigms. 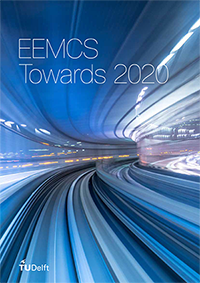 The Faculty of EEMCS will make a real contribution to developing sustainable products and systems and address the challenges of energy production, storage and distribution. The multi-annual plan of the faculty of Electrical Engineering, Mathematics ans Computer Science.